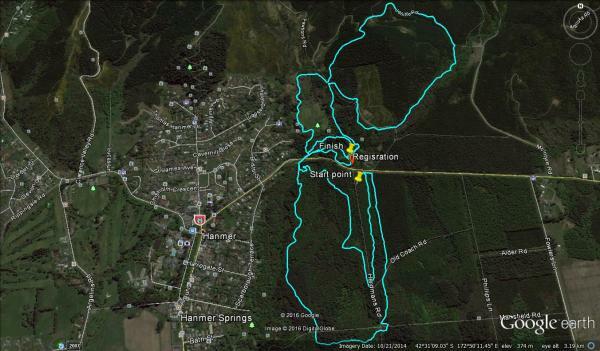 Excellent course for those wanting to step up to these distances or try off road trail ultras for the first time. Elevation gain/loss approximately +/- 200m per lap. The race format is a lap format on a 10km, figure 8 (roughly) lap. The Southern loop of the lap (first half) is run anticlockwise with the Northern loop clockwise, each loop is roughly 5km with the total lap start/finish in the middle, so effectively you will pass the aid station and finish area every half lap. There is ample space for support crews to set up here. Age groups: These will be applied where there are sufficient competitors to warrant reasonable competition (min of 10 competitors) in the 50km. The 80.5km and 100km will be open class only for this year. Race briefing will be 10 minutes prior to your race start with competitors to make their way across the road ready for their start. All races will start on Herdmans ave, on the south side of Jollies Pass rd, and follow a seperate course around the old forest roads before joining the main loop – this is to allow competitors to spread out before hitting the awesome singletrack. NOTE! As the course itself does not cross the road (it goes under via the Dog Creek Bridge) there will not be road control working, so please enusre you cross the road safely! Given the confined nature of the course there will not be any compulsory gear to carry, however you should be prepared for running in all weather conditions – including snow! Extreme conditions deemed likely to cause harm to competitors will result in adjustments to the distances or complete cancellation. All competitors must start their final lap by 6pm. Those who dnf (due to time limit) on their entered distance may (where applicable) be given a time for the next previous distance. The course itself is 9.2km of sweet needle strewn (at present) singletrack goodness, with approximately 800m of gravel forest road – from approximately 50m below the highest point of the course. With the Southern loop in particular winding through several original experimental plantings (from as early as 1901) of exotic timber species, including Larch, Douglas Fir, Spruce, Radiata and Corsican/Austriaka. There are several foot bridges and staircases to climb and one section along the side of Dog Creek and around Squirrel Lake. Competitors can expect any and all weather conditions – be prepared and stay adequately hydrated. There will be a main aid station/marshal point at the finish area junction. There will not be any compulsory gear list but – it can go from hot sun to heavy snow in a matter of hours even in the height of summer so ensure you are prepared for all conditions. All Competitors must attend the race briefing –Race briefing will be 20 minutes prior to your race start. Hopefully (TBC) the local Scout group will be on hand to supply hot soup and other goodies so bring your change.